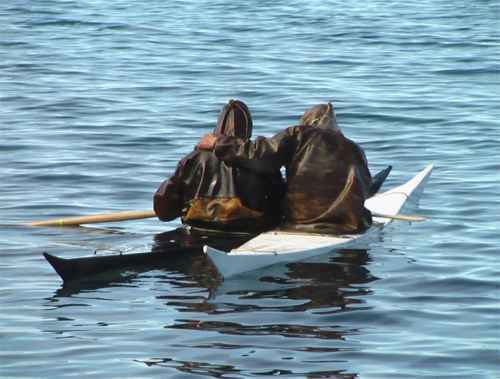 When two more kayakers sit side by side, holding onto each other's kayaks, they make a raft which will not capsize or break up in normal sea conditions. One way to demonstrate this to a student group is to have some of them get out of their kayaks at sea and walk around the raft. Choose light people - a lightweight kayak will be damaged if a 200 lb man walks on the deck. A raft makes a stable platform for deep-water rescues. In rough conditions or during a rescue, a firm grip is needed to keep the kayaks together. One kayaker can lean right onto an adjoining kayak, resting his/ her entire upper body on it and gripping it firmly with both arms. Casual rafting-up takes only a few seconds and is handy when you want a hot drink, a chat or to take photos. Wind or currents can move a raft along at walking pace. You can keep an eye on your position from time to time using ranges, and if the raft is drifting into danger one or two of the group can separate and tow it. It's easy to tow a sea kayak because its long slim shape goes in a straight line with little resistance. Towing a very short kayak is a lot more work because it has more drag and will swing from side to side, to the extent that it may capsize if towed too fast. We like to tow with an ordinary whitewater tow-belt or occasionally with a paddle park / tow point. Some sea kayakers prefer to use a towing cleat. To attach a tow line to another kayak you can use a snap-link or a quick-release knot. Either way, practice under controlled conditions so you know that you can detach your tow line when you're upside down! Suitable for towing a sea kayak in good conditions. The person doing the towing just pays out (say) 16 feet of tow line, attaches it to the front of the other kayak and starts paddling. On a calm day, the person being towed can sit back and relax. If the casualty is tired but otherwise OK it will make the rescuer's job easier if the casualty uses his / her paddle to steer. See Stern Rudder. If there are three of you and the casualty is unwell or is in a very short kayak, the third person can raft up with him. If everybody is using sea kayaks, a single rescuer can quite easily tow both boats. If there are only two of you and the other kayaker feels unwell or is in a very short kayak, use a short tow between 1 and 8 feet long. If you use a really short tow with a paddle park / tow point the other kayak will be alongside yours, and the other kayaker can hold onto the back end of your boat. If you find it hard work to go in a straight line you can ask the other kayaker to pull until the kayaks are parallel. He can rest his upper body on the back of your kayak and close his eyes. To tow a long way on open water, two or more kayakers can tow the casualty at the same time. Each attaches a tow line to the front of the casualty's kayak. If they both have long tow lines, one can use 30 feet of rope and the other 20 feet. This makes it easy for them to avoid each other. If more than two kayakers are towing, they can spread out in a fan shape like huskies pulling a toboggan. High-speed towing by two or more kayakers is a fun way to warm up. The towing kayakers need to keep looking over their shoulders to see all is well, because three kayakers generate so much power they may not notice the difference if the casualty capsizes. Inside the surf zone, it is best not to attach one kayak to another. The rescuer will not be able to respond to a big wave, and if anybody capsizes they may get tangled up in a tow rope and find it difficult either to roll or make a wet exit. You can use a rafted or contact tow instead. See Shunting With A Kayak, below. One kayak can easily tow a beach inflatable or a windsurfer. If there are enough of you, you could tow pretty much anything, even in windy conditions. Towing long distances or heavier weights is not something to do lightly because it can give you an overuse injury. The more important question is "But do they want help?" Anybody drifting helplessly out to sea on a beach inflatable is likely to want help, and to say thank you afterwards. One summer, as a kayak instructor near a tourist beach, I used to tow stray windsurfers back in three or four times a week. Some of them were moderately grateful about it. Yachtsmen are likely to prefer drowning, death by starvation or loss of the boat to being towed back into harbour by a bunch of kayakers. "One summer day in 1979, I was about two miles off Gribbin Head, on my own. No radio. No mobile phones either, not back then. I was paddling a Mk 1 lifeguard rescue kayak. There was nobody else around, and it was a lovely calm sunny day. After a while, a 16-foot runabout with a 40hp outboard went slamming past me. When I looked round 20 seconds later, no more boat. I paddled over and found three divers in the water, all getting into wetsuits, and a teenage boy in summer clothing. They were all floating next to the capsized runabout. The boy said hi, the men ignored me completely. The boat was bottom up and probably had a couple of tons of water in it, so towing it was not an option. Small waves were washing right over it. It was so low in the water that it was invisible from 30 yards away. In fact, it looked to me like it was going to sink.. I suggested they think about ditching the dive tanks and the outboard. The men made some grunting noises. Apparently they didn't think much of that idea. I suggested they empty the fuel out of their portable tank to get some extra buoyancy. The older man said, "What the f*** does it look like I'm f***ing doing?" I tried towing the teenager and one of the men behind the kayak, but after about five seconds we could see that wasn't going to work. I then got the teenager onto the aft deck of the lifeguard kayak and gave him a stern carry two miles to the base of the headland. That took about 40 minutes. I offloaded him onto the rocks, then paddled round to Menabilly and phoned the Coastguard. About 20 minutes later, a Navy helicopter appeared. It wandered around for a bit, disappeared, reappeared, and picked up the three men. The Fowey lifeboat arrived 20 minutes after that, retrieved the teenager, who was fine, and towed the boat in very slowly. The three divers needed hospital treatment for hypothermia." If they want to be rescued by you, you are the boss. Take control of the situation and don't put up with any nonsense. The casualty may (or may not) understand his own boat, but he won't understand a kayak's abilities, or its limitations. Assess the situation, and tell the casualty what he can do to assist you. Can the towed boat do anything to make itself an easier tow? You don't want it dragging anything in the water, and you don't want anything catching the wind unnecessarily. Generally you want the tow attached as close as possible to the front of the towed boat. Deploy the full length of your tow-rope and instruct the casualty either to tie it to the front of their boat or to put it through a fairlead at the bow (or wrap it once round the forestay if it's a sailing dinghy) and tie it off to a cleat, mast, etc. Windsurfers / sailboards. The boardsailor who is most likely to need a tow is the beginner, who will be on a big, floaty, high-volume board. Even an expert with a low-volume board may need a tow if the wind dies and the current is taking him / her away from land. The casualty will have to lie on top of the board and hold the tow-rope near the front end. This is fine with a floaty board but otherwise the casualty's weight near the front will make the nose sink, so you may need to experiment. Ask the casualty to retract the daggerboard, if any. If you are going more than 100 yards or so, ask the casualty if he can get his rig on top of the board. You don't want the sail dragging in the water, but if this means 2 or 3 minutes totally disabling the windsurfer, so the sail can be partly rolled up, it may be better to tow him the hard way. If the sail is rolled up, you'll have to tow the board all the way to the beach and not just into smoother water. Sailing dinghy. A racing dinghy may look as if it needs a tow, but there's a good chance there's a sailing club rescue boat nearby, or they may have oars. If they really want a tow, ask them to retract their centreboard / daggerboard. This will reduce drag, and reduce the amount by which the towed boat yaws from side to side while you tow it. If there's any wind at all, ask them to take the sails down. Ask them to use the rudder to keep directly behind you. If you don't have a tow-rope or you are in the surf zone where it would be risky to attach yourself to another kayak, you can still achieve quite good results. To shunt a single sea kayak, get in line with it so that you and the casualty are facing each other. Paddle forwards until your bow is just past the casualty's cockpit. Tell the casualty to hold onto your kayak. He can lean onto it, putting the weight of his upper body onto it while holding onto your perimeter line with both hands. Then you can pull or push his kayak. If you are going more than a very short distance, attach the end of his kayak near your cockpit. The ideal thing for quickly attaching another kayak is a paddle park / tow point. To shunt a pair of sea kayaks, get them to raft up together, then put the bow of your kayak in between theirs and start paddling forwards.